As of this month, most US citizens will no longer be allowed to travel to North Korea. The death of Otto Warmbier appears to have been the final straw. Warmbier was a young American tourist arrested after what appears to have been a prank in North Korea in 2016. Imprisoned, he received ‘medical care,’ likely from a hack doctor, given that high-quality care in North Korea is rationed for elites. He fell into a coma, was returned to the US this spring, and died shortly thereafter. Naturally, North Korea accepted no blame for this young man’s pointless death. Once again, North Korea demonstrated its breezy disregard for global norms. Warmbier was an apolitical youngster in far over his head, clearly not attempting to ‘bring down the state’ as he was charged. It is transparently obvious that he was picked up to use as a bargaining chip. It is widely assumed that US citizens arrested by North Korea are only returned after some backroom deal is made. Presumably that was the intent with Warmbier as well. That even his life-threatening health crisis did not move the regime to release him until too late is likely the major reason why Rex Tillerson’s State Department moved on the travel ban. The notion of a North Korean travel ban has lurked on the fringes of the analyst community debate for a long time. The increasing taking of US hostages under the Kim Jong Un regime had revived the policy idea, while Warmbier’s unprecedented death – no other American tourist-turned-hostage has died after being taken into custody in North Korea – suddenly elevated it. Kim’s predecessor and father, Kim Jong Il, took the occasional hostage but likely saw the tourist trade as valuable source of income. Under Jong Il, the military’s position in the economy was elevated, and North Korea’s economy unsurprisingly contracted, including a famine that killed nearly 10% of the population. In that environment, every dollar counted. Jong Un though has explicitly focused on economic growth, and it seems to be working. Hence, he may feel freer to take hostages as political bargaining chips as their relative economic value shrinks. 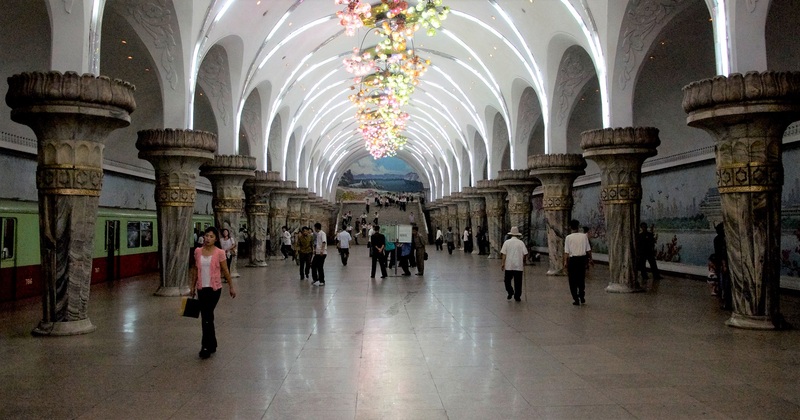 It is difficult to know how much the tourist trade nets North Korea. The regime provides no statistics of course. My back-of-the-envelope math suggests North Korea will lose about $US5 million dollars from the US ban. I travelled to North Korea in 2012 with the largest of the tour companies that travels there, Koryo Tours. (Warmbier went through Yong Pioneer Tours.) I spent approximately $5000 on a standard, 10-day tour and roughly 1000 Americans have been travelling to North Korea each year. For perspective, in 2016 North Korea’s GDP was $28.5 billion, and it raised around $80 million a year from the now-closed, North-South joint industrial park at Kaesong. So, economy-wide, $5 million is not a large amount. But North Korea has repeatedly sought the re-opening of Kaesong, and the loss of tourism income, both from banned Americans and others now frightened off from visiting, will have two impacts. First, North Korea exports almost nothing (legally). So hard currency is in great demand to fund the imports of luxury goods and foreign technologies for the nuclear and missile programs. It is widely thought that the Kims keep the loyalty of their retainers by showering them with gifts like foreign cars, HDTVs, top-shelf alcohol, and possibly narcotics. Dollars are needed for this and to participate in global WMD black market. It is curious that Kim simply did not let Warmbier leave. It would have been easy to do, and he could easily have been replaced by another tourist later. Instead, Kim lost an easy source of US dollars. Second, legal western currency, even in small amounts, has a multiplier effect. Legal tender allows North Korea to wash revenue from its (presumably) much larger currency-raising operations of illegal activities. Chinese banks, where North Korea likely parks its money, are coming under greater scrutiny as the sanctions debate turns increasingly toward financial restrictions. Legal monies from tourism and Kaesong were a nice way to deflect that pressure. Indeed, conservatives in the US and South Korea long argued to stop tourism and inter-Korean projects – for which North Korea always insists on payment – for precisely this reason. It is again curious that Kim did not simply make the minor concession of releasing Warmbier. Given Warmbier’s death and Kim’s zeal for US hostage-taking, the ban is probably a good idea at this point. When I went, it was still pretty safe. But I have not counseled anyone to go in years given the up-tick in snatchings. The ban does violate the basic right of freedom of movement. The US rarely bans travel; even the Cuba restrictions are fading. But it has become quite obvious that Kim is happy to use in-country foreigners as hostages; he did the same with Malaysians a few months ago. The ban is also a way to punish North Korea at a time when we are genuinely at a loss for how to retaliate against it for its many regular provocations. President Trump’s impulse is to strike North Korea, but he cannot, and yet more sanctions seems to be a stale and redundant course of action (though I would argue not). So this is at least a mild, and justified, counter-punch. But it does come with a loss. American tourism into North Korea was the last, only way for regular, non-elite Americans and North Koreans to interact. Yes, it was all highly staged. Yes, it was perverted for ideological purposes by the regime. But there still was some people-to-people contact removed from the high politics of distrustful elites. North Koreans in stores, at parks, on the street, and so on could see, at least a little bit, regular Americans talking, laughing, asking to buy lunch or where to find a bathroom like everyone else in the world. And vice versa. It was not much, but at least it was something to humanise the other side. However necessary the ban is, it is too bad that that is all over.